Richmond Hill is a town in south-central York Region, home to over 200,000 people. This makes it the most populous town as well as the fastest-growing community in the country. With a large portion of residents employed in finance, business, healthcare, and industry, the area’s homes are large and the tree-lined properties are larger! Town officials believe that trees are essential for today’s quality of life as well as for the future, which is why Richmond Hill has strict regulations regarding the injury or removal of trees on private properties. Although a detailed plan has also been developed to combat emerald ash borer (EAB) infestations in public areas, homeowners remain responsible for protecting their own ash trees. This is where Sequoia TreeScape comes in. As a dedicated provider of tree service to Richmond Hill residents for many years, we are the lead source on keeping private properties healthy and green for a lifetime. Furthermore, our trained experts are well-versed in the town’s Tree Preservation By-law to offer homeowners the highest quality service. Regular care from a professional arborist is the only way to maximize the longevity of your trees and keep them safe from the EAB and other harmful pests. Should a tree die, contract a disease or become otherwise hazardous to surrounding trees, buildings and people, our team will remove it safely. We will also grind out the stump to eliminate tripping hazards. This is the level of service that you can expect from Sequoia TreeScape. 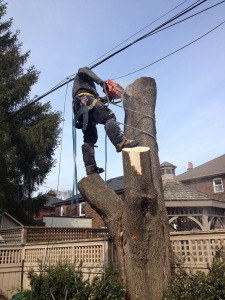 Whether the trees on your property require pruning, removal or anything in-between, you can count on us and our all-encompassing tree service in Richmond Hill, ON. Call (416)-770-8733 or request a free quote via our website today!